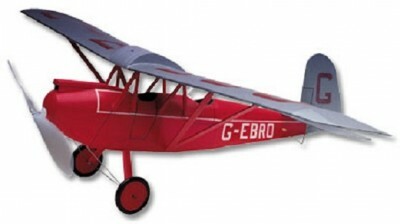 Although not actually a 'homebuilt', the Widgeon captures that concept quite well and adds that 1930's aura as a bonus. Our Widgeon faithfully reproduces the original, right down to the negative tail incidence. Yes, negative, just in case owners thought it was a mistake! It's all a matter of balancing the various incidences to get the right flying performance. Construction starts with cutting out the pre-printed balsa components from their balsa sheets and then combining them with plan and strip in the time honoured fashion. Like all our kits, you can use Cyano glue or one of the specialist Aliphatics like Deluxe Superphatic. This glue is ideal for our kits as it adds little extra weight and can be used a bit like Cyano. The kit contains all the required items of hardware such as wire, wheels, propeller, rubber and tissue covering. As is usual with this kind of kit, you will still need to purchase glue, dope and maybe lightweight paint. This is not a slow flying model, but has a unique look in the air. It does however, benefit from the stability that a high wing mount provides and is simple to trim.